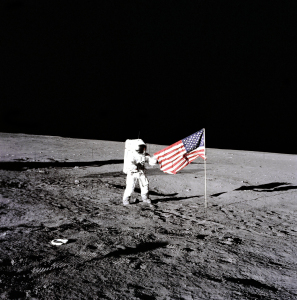 Apollo 12 Commander Charles “Pete” Conrad on the surface of the Moon. On 25 May 1961, American President John F. Kennedy delivered a speech to Congress in which he stated that the United States of America should set landing a man on the Moon as a goal to be achieved before the end of the decade. Project Apollo was set up to achieve this goal. The Apollo spacecraft was made up of three parts: the command module (CM), from where the crew controlled the flight and also lived; the service module (SM) for the propulsion and spacecraft support systems; and the lunar module (LM), which would take two of the crew to the lunar surface, support them while they were on the Moon and then return them to the CM while in lunar orbit. On 20 July, 1969, at 20:18 Coordinated Universal Time, the LM of the Apollo 11 mission made the first manned landing on the Moon. At 22:55 Coordinated Universal Time on 14 December, 1972, the LM of the Apollo 17 mission lifted off from the Moon’s surface. Apollo 2, 3, 4, 5 and 6 were unmanned missions. Notes : The primary objectives for this engineering test flight included demonstrating the command-and-service module (CSM) and crew performance; demonstrating crew, space vehicle and mission support facilities performance during a crewed CSM mission and demonstrating the CSM rendezvous capability. Notes : The Apollo 8 mission objectives included a coordinated performance of the crew, the command and service module (CSM) and the support facilities. The detailed test objectives for this flight were to refine the systems and procedures relating to future lunar operations. Notes : The main objective of Apollo 9 was to complete an Earth-orbital engineering test flight of the first crewed lunar module (LM). A series of flight tasks were to be completed between the CM, the CSM, the service module (SM) and the LM while they were linked in launch. The LM, ‘Spider’, was designed and tested to be a self-sufficient spacecraft, and should be able to perform rendezvous and docking manoeuvres identical to those scheduled for Apollo 10, the lunar-orbit mission. Notes : The Apollo 10 mission was designed to be the “dress rehearsal” for Apollo 11, which would include an actual lunar landing. An eight-hour lunar orbit of the separated LM was one of the objectives, along with a descent to roughly nine miles off the Moon’s surface. Notes : The Apollo 11 mission was the first to achieve a national goal set by President John F. Kennedy in 1961; perform a crewed lunar landing and return to Earth. The crew members left behind on the Moon’s surface commemorative medallions bearing the names of the three astronauts who died in the Apollo 1 fire, and a silicon disk containing miniaturised goodwill messages from 73 countries. Notes : Apollo 12 was the second crewed lunar landing. Extensive lunar exploration tasks were carried out by the LM crew, and the Apollo Lunar Surface Experiments Package (ALSEP) was left on the Moon’s surface after the exploration tasks were completed. The ALSEP was designed to gather seismic, scientific and engineering data over a long period of time. Notes : The Apollo mission named ‘the successful failure’ was due to be a third lunar landing attempt. An explosion on board forced Apollo 13 to circle the Moon only, without landing in the planned Fra Mauro area. The ‘successful failure’ tag came from the efforts in saving and rescuing all three crew members on board. Notes : Almost a year after the Apollo 13 near-disaster, Apollo 14 was launched with the intention of exploring the Fra Mauro region and collection of surface materials from the Moon. The crew also deployed other scientific materials that were not part of ALSEP, and took photographs of future landing sites. Notes : The Apollo ‘J’ missions were designed for longer stays on the Moon, and Apollo 15 was the first of these missions. The objectives that it was designed to complete included exploration of the Hadley-Apennine region, as well as continuing to activate lunar surface experiments and take photographs. Notes : Apollo 16 carried on the experiments and surveys of the lunar surroundings, with a selected landing site in the Descartes region. Additional objectives on this missions included testing the performance of experiments that required zero gravity, alongside an engineering evaluation of the spacecraft and its equipment. Notes : The Taurus-Littrow highlands and valley area was the selected lunar landing site for Apollo 17, the last of the manned Apollo missions. The landing site was chosen specifically for its rocks; the crew of Apollo 17 wanted to find rocks that were both older and younger than those discovered on previous Apollo missions. 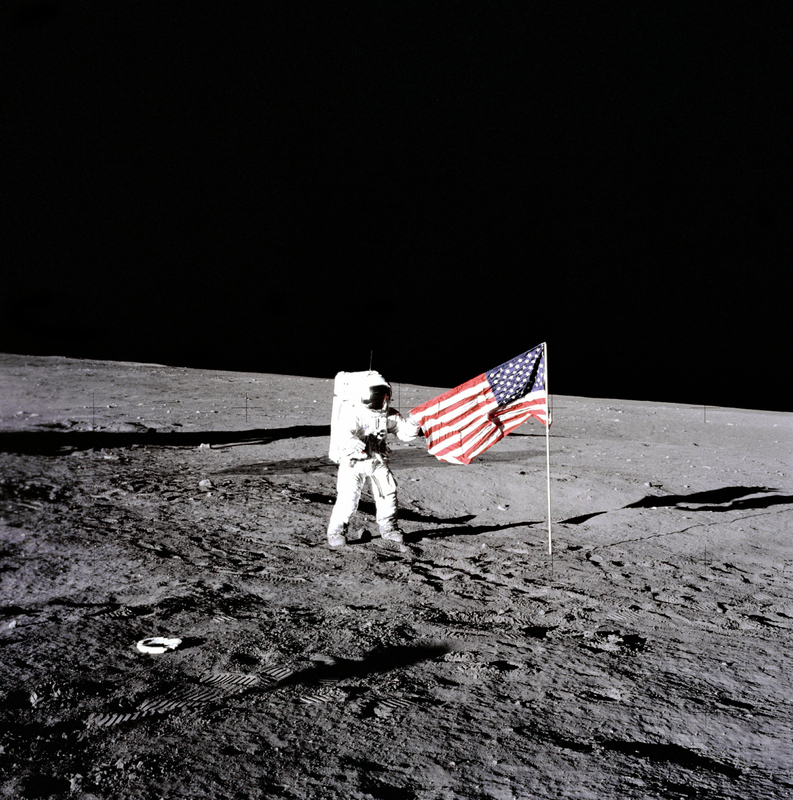 For more detailed information on the Apollo missions, visit the NASA website.